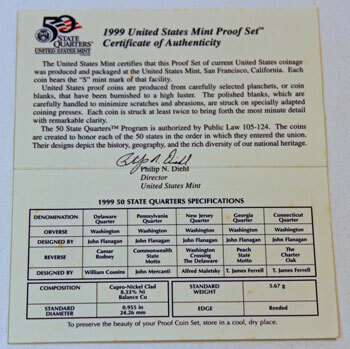 The folded card in the 1999 proof set included a message from the Director of the Mint which certified the nine proof coins, described the proof set process and provided the proof coins' specifications. The outside of the 1999 Proof Set Certificate of Authenticity has a shiny surface. 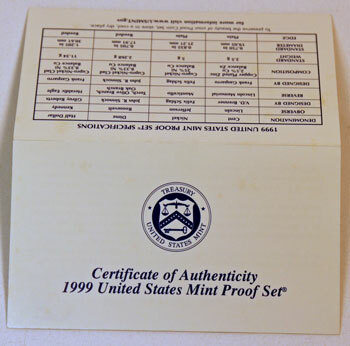 The front of the certificate includes the title, "Certificate of Authenticity 1999 United States Mint Proof Set" in a dark blue font. Above the title is the US Mint Seal in dark blue. Inside the outer circle of the seal, the words "TREASURY" and "UNITED STATES MINT" show against the white background. In the inner circle, a white shield includes scales at the top, a chevron with thirteen stars in the middle and a key at the bottom. The back of the card provides the specifications and characteristics of the cent, nickel, dime and half dollar proof coins (see below for table). The inside of the card uses a matte finish for the background of the Director of the Mint's message and the specifications for the five state quarter proof coins. The 50 State Quarters™ Program is authorized by Public Law 105-124. The coins are created to honor each of the 50 States in the order in which they entered the union. Their designs depict the history, geography, and the rich diversity of our national heritage. The table on the back side of the folded certificate provides the specifications for the other four proof coins in the proof set. At the bottom of the table, the US Mint provides their web site address if the collector wants more information about the proof set or the proof coins. 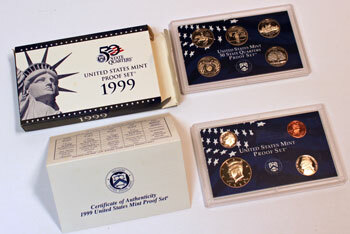 Click 1999 Proof Set to view the contents of the proof set package with its nine proof coins.